The world’s largest pumpkin weighed 1,689 pounds! For fun ideas on how to use a pumpkin (including turning it into a vase! ), read this article. What is your favorite pumpkin craft or recipe? My mom has this incredible pumpkin break recipe! A lot of my friends suprisingly like it, and even some who don’t necessarily like pumpkin. 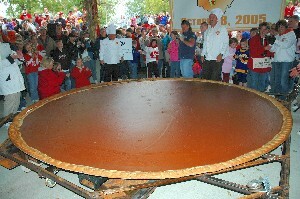 That is the biggest pie ive ever seen! it is my screen saver(: i love pie and so does my best friend Dana we make bunches of pies and then we eat them all up!